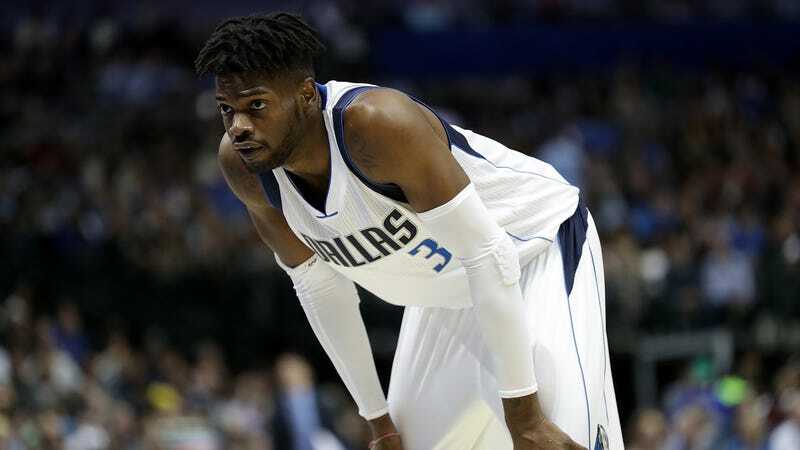 The NBA announced today that they’ve suspended Mavericks forward Nerlens Noel for five games, reportedly following a third positive test for marijuana, a drug that is legal or decriminalized in much of the country. That alone is not a big deal, but Noel’s suspension—which will see him out for the conclusion of the Mavs’ season—is a pretty demoralizing endnote on a year that has gone very, very poorly for the former lottery pick. If you remember back to last offseason, the Mavs offered restricted free agent Noel a four-year, $70 million contract after trading for him at the 2017 deadline. Noel rejected that, asked for a max contract, and the Mavs subsequently ended negotiations. Noel eventually signed for one year and $4.2 million after switching agents. That was a rough way to head into the season, though even then, it still could have been the beginning of a story about a player believing in himself, proving his talent on the court, and eventually receiving an even more lucrative contract. Unfortunately, there’s no reason to think that’ll happen this summer. Noel hasn’t stayed healthy this year—he tore a ligament in his left thumb in December and missed 42 games— and even when he’s played, he has not impressed. In 15.7 minutes a night, Noel has averaged just 4.4 points and 5.6 rebounds—all of which are career lows. This has been, without a doubt, the worst year of his career. In fairness, the Mavs are stuck in the toilet and have no incentive to win right now, so a lack of playing time or success shouldn’t be taken as a wholesale reflection of what Noel is capable of on a team actually trying to win. Additionally, Noel will only be 24 this offseason, so as long as he’s in the league, he’ll have plenty of time to show he’s worth more than a minimum deal—such as, for example, $70 million. Still, that money was already there, and now it’s gone, so this season has to sting, as does its especially forgettable conclusion. Former Mavericks Employee Who Made Harassment Claims: "I&apos;m Still Not Sure The Mavericks Get It"